JOP. Journal of the Pancreas is covered in the Emerging Sources Citation Index, which means all articles published in the journal are indexed in Web of Science at the time of publication. JOP is a peer-reviewed and an open access journal publishes manuscripts bi-monthly on relevant topics including etiology, epidemiology, prevention, genetics, pathophisiology, diagnosis, surgical and medical management of pancreatic diseases including cancer, inflammatory diseases, diabetes mellitus, clinical pancreatology, internal medicine, clinical research, gastrointestinal surgery, endocrinology, hepatology, management of acute pancreatitis, diabetes, pancreatic ductal adenocarcinoma and its treatments, chronic pancreatitis, neuroendocrine tumor, cystic fibrosis and other congenital disorders. The submissions include original research, case studies, innovations in program development, scholarly reviews, theoretical discourse and book reviews. Additionally, the Journal encourages submission of responsible speculations and commentary. JOP. 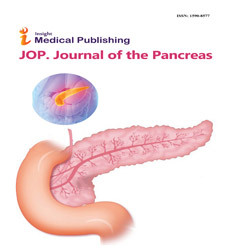 Journal of the Pancreas provides topical reviews and updates relevant to pancreatic anomalies and therapy along with ongoing annotated research reviews published elsewhere, making the Journal a unique and valuable reference resource. The editorial board consists of a panel of international luminaries entrusted with the task of providing the readership the state-of-the-art information that will be of great value to all that function within the field of pancreatic research. The JOP. Journal of Pancreas follows single blind peer review process for validating the quality and worth of each received manuscript. Review process is performed under the aegis of the Editorial Board members of the Journal. After primary quality check each article is reviewed by the outside experts under the guidance of the assigned Editor. At least two independent reviewers approval followed by Editor approval is mandatory for acceptance of any submission. This is an open access journal which allows all content available freely without any charge to the individual user or any Institution. Users are allowed to read, download, copy, distribute, print, search, or link to the full texts of the articles, or use them for any other lawful purpose, without any prior permission from the publisher or the author provided the author is given due credit wherever necessary. This is in accordance with the BOAI definition of open access.. The pancreas is a long, flat gland that located in the abdomen behind the stomach. It produces -several important enzymes that are released into the small intestine to help with digestion. Pancreas also contains clusters of cells called islets. The cells in these islets produce hormones such as insulin and glucagon, which help control the level of glucose (a type of sugar) in the blood. Pancreatitis is inflammation in the pancreas. The pancreas is a long, level organ that sits tucked behind the stomach in the upper abdomen. The pancreas produces enzymes that help digestion and hormones that help direct the way your body procedures sugar (glucose). Pancreas can occur as acute pancreatitis and chronic pancreatitis. Chronic pancreatitis is a permanent inflammation of the pancreas that does not heal or improve and alters the organ's normal structure and functions. It is usually followed after an episode of acute pancreatitis. Heavy alcohol drinking is another major cause. Chronic pancreatitis can present as episodes of severe inflammation in an injured pancreas, or as chronic damage with persistent pain or malabsorption. Diabetes is a common complication arising due to the chronic pancreatic damage and requires treatment with insulin. Pancreatic surgery is a challenging procedure and is done when it the only option that can lead to a prolonged survival in pancreatic cancer and, or in some cases, perhaps a potential chance for cure. It is used for treatment of chronic pancreatitis and other less common benign diseases of the pancreas. Whipple’s pancreaticoduodenectomy is the operation most commonly performed surgery for tumors of the pancreatic head. It involves removal of part of the stomach, the whole of the duodenum, part of the small bowel, the head of the pancreas, the bile duct and the gallbladder, leaving behind the major blood vessels. The main goal of pancreatic surgery is the relief of intractable pain and decompression of adjacent organs. Pancreas transplantation is the transfer of a healthy pancreas from donor to patients with diabetes. Since pancreas is a vital organ, the patient's native pancreas is left in place, and the donated pancreas is placed in a different location. This is done because in case of rejection of the new pancreas, the patient will develop severe diabetes and he would not survive without the native pancreas still in place. The healthy pancreas comes from a donor who has just died or from a brain dead person. At present, pancreas transplants are commonly done in persons with severe insulin-dependent diabetes. Artificial Pancreas is a technology developed to help people with diabetes automatically control their blood glucose by providing a replacement of insulin of healthy pancreas. The main aim of artificial pancreas is to provide an efficient insulin replacement therapy so that blood glucose control is normal and there are no complications of hyperglycemia. Artificial Pancreas eases the burden of therapy for the insulin-dependent. This system is worn like an insulin pump and has been termed the 'artificial pancreas' because it monitors and adjusts insulin levels just as the pancreas does in people without diabetes. Pancreas is an organ, which plays a major role in digestion and hormone production. Disorders of pancreas include acute pancreatitis, hereditary pancreatitis and pancreatic cancer. The journal stocks up information about pancreatic disorders, methods of detection, different therapies and advanced treatments to overcome pancreatic disorders.